Growing up, my favorite part of Thanksgiving, besides my mother’s cinnamon rolls, was its universality. As a national holiday it was a day all Americans could celebrate together. Even the Wampanoag and the Pilgrims shared a feast that first Thanksgiving and lived peacefully together. Or at least that’s what I was taught in school. As a white Christian whose image and beliefs are echoed everywhere as “true American,” Thanksgiving really is my story. The Precious Moments Thanksgiving figurines look like me. A letter written by Pilgrim Edward Winslow in December 1621 to a friend in England tells of a harvest feast celebrated by the European settlers to which they invited the Wampanoag. The story of a shared feast in the New World may not be inaccurate. What’s forgotten in our storytelling is that without help from the Wampanoag, the settlers would not have had a harvest. The hospitality shown by the Wampanoag was not echoed by the settlers or any thereafter. Thanksgiving mocks the radical hospitality shown by the Wampanoag. So Thanksgiving may not have started off as a universal holiday—but it doesn’t need to stay this way. This Thanksgiving we can acknowledge the holiday’s white-privilege-laden origins and work to make it a truly inclusive holiday as we work to make the world one in which all can thrive. For then we will all have reason to be truly thankful. In this month’s Bible study, “A Place at the Table,” Sharon A. Schmit asks us to “pause to focus on the question of not where we will be or what food we will eat but who will be at God’s table with us, not only on November 27 but also throughout the coming year.” Can we vow to do this? Who is at the table in your United Methodist Women group? Who is missing? Who needs to be invited? Read “Welcome: The Pathway to Membership Growth” by Sally Vonner and host a welcoming event. 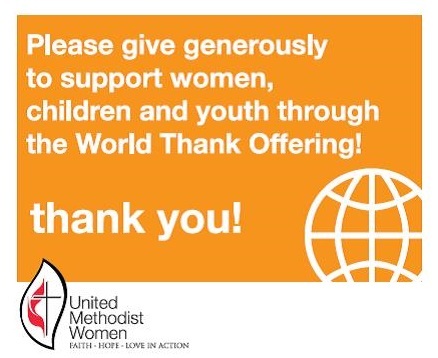 The United Methodist Women Program Book 2014-2015, Welcomed by God, Welcoming All, offers a program on the World Thank Offering this month. Take time to not just say thanks but give thanks. Read “A World of Thanks” by Praveena Balasundaram and do the November program with your group. Encourage your congregation to join in spontaneous gifts of thanks by placing World Thank Offering donation containers throughout the church and make announcements. You can find new, colorful labels online. Translate the gratitude you feel for life by donating to World Thank Offering. Read “Three Generations of Women” by Joanne Jolliff and Caroline Shadburn on pages 16-17, and thank the important United Methodist Women members in your life this month by contributing to the Living Timeline. May you be blessed this month as you bless others. Happy Thanksgiving. This entry was posted in How to Use This Issue, Social justice. Bookmark the permalink.